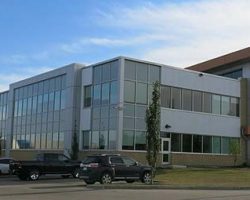 8404 McIntyre Road NW is a single tenant office/industrial building in Edmonton located off Whitemud Drive. The property was built in 2001 and an addition was built in 2013. 8404 McIntyre Road NW is situated on 8.91 acres of land, and is part of a portfolio known as the Graham Portfolio. Ceiling Height Approx. 22 ft.